In multi-hop wireless networks, minimizing the transmission time is very important. 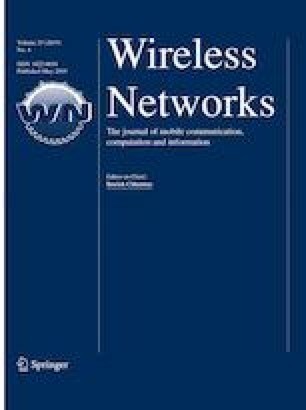 In this paper, a high-reliability relay algorithm (HRRA) is proposed to decrease the transmission time based on the network coding in multi-rate environment. The HRRA includes the relay selection algorithm (RSA) and the block transmission algorithm (BTA). Based on the relay reliability of node, RSA chooses the neighbor with the higher link rate as the common relay node and creates more network coding opportunities at the common relay node. Thus, the network coding opportunities and the high-rate links associated with common node could both be exploited in the transmissions of BTA. Moreover, a comprehensive theoretical analysis of the transmission time of HRRA in a block is presented. Lastly, the simulation results show that HRRA can significantly reduce the transmission time compared with the shortest path algorithm and heuristic relay node selection algorithm and COPE. This work is partly supported by Natural Science Foundation of China [61401144, 61571179].